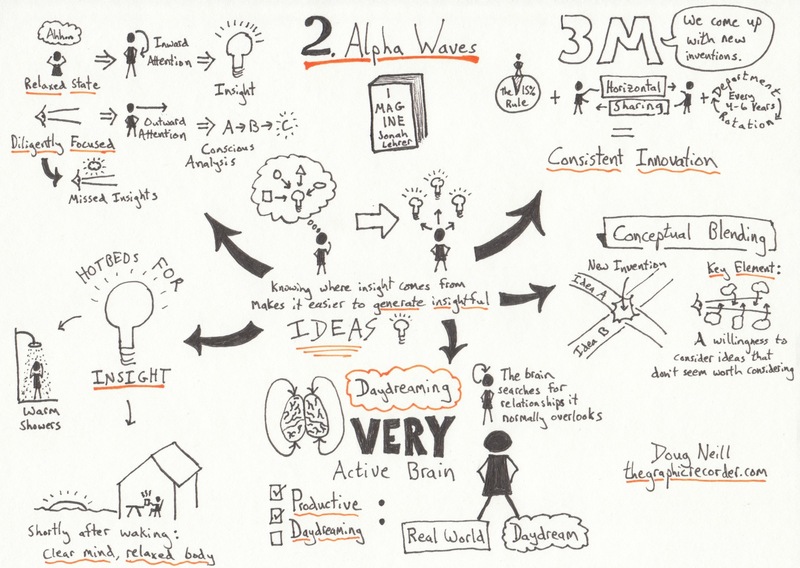 My recent sketchnotes of Jonah Lehrer’s book Imagine: How Creativity Works were the result of a new process of visual note-taking that I was testing out for the first time. I found that process very useful, so I decided to share it with you here. 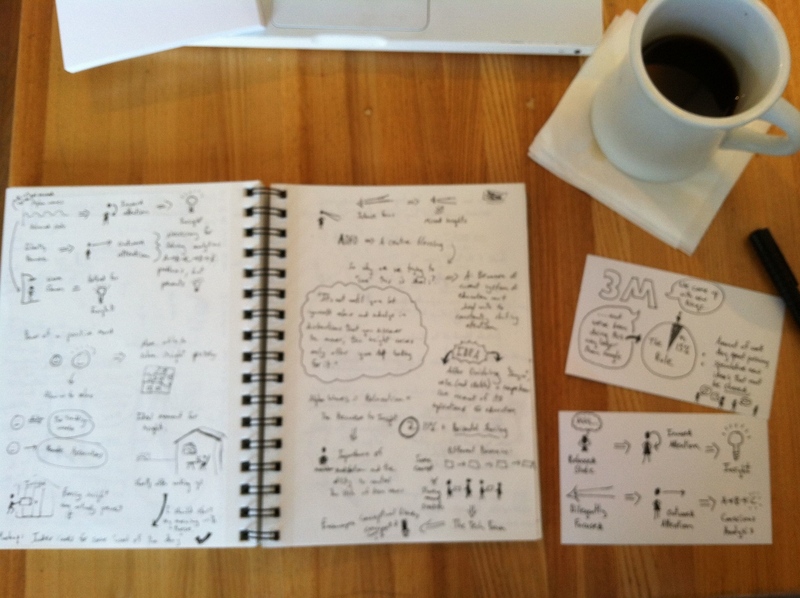 What follows is not the only way of going from verbal ideas to visual ideas, but it works for me. Maybe it will work for you as well. Step 1: Reading and Rough Sketching. 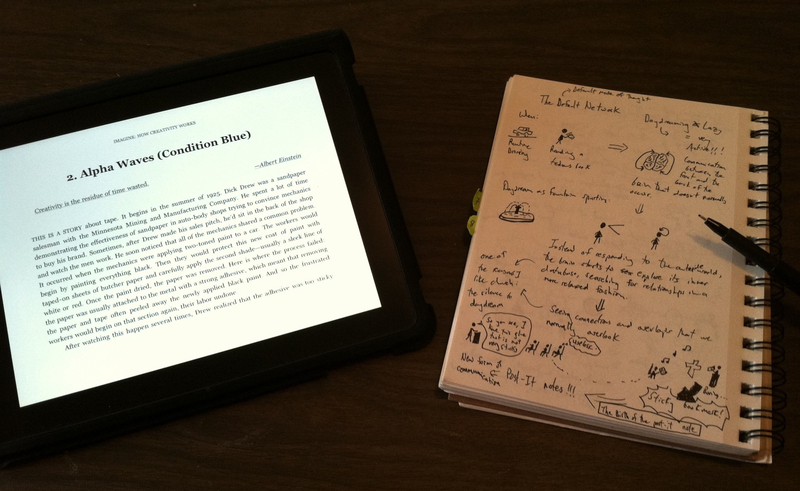 As you read, take some rough notes and sketch out some initial attempts at visualizing the ideas within the text. Get in as much visuals as you can but don’t worry about making every single idea visual. The important thing here is to not spend so much time worrying about creating visuals that you lose the flow of the text. Do what you can, but keep in mind that you’ll be able to come back later and fill in any visual gaps. Also understand that with more practice this step will become more and more natural, and you will find it easier to move quickly from verbal ideas to visual ideas. In this stage you take the most important ideas and put each onto one 3×5 note card. The point here is to refine the visual form of each important concept – making sure that it is clean and crisp. The benefit of this stage is that it gives you the opportunity to test out ideas in a contained space with minimal pressure. I often go through a few versions of an idea before I am happy with how it turns out. The nice thing about working with 3×5 cards is that I don’t feel like I have lost any momentum even if it takes a couple of drafts before I feel that I have cleanly captured the idea. This stage also gives you time to ponder how to turn the remaining verbal notes into visual notes. I have decided to catalog my own 3×5 cards for future use as part of my One Card One Concept project. In this step you take the individual concepts and determine how to arrange them in a complete sketch. This stage is important because you are looking for the most appropriate way to structure the individual ideas. The more the form of your arrangement aligns conceptually with the content of the cards, the easier it will be to look back on the sketch and understand right away the big picture as well as the details. In the example shown in the images above and below (from my sketchnotes of Jonah Lehrer’s Imagine), I have placed the motivation for learning the material at the center, and then grouped related ideas as offshoots of that central motivation. In the fourth and final step you follow the layout and turn all of your individual ideas into one complete sketch. You’ve had practice with each of the individual sketches and you’re ready to focus on the big picture. As you follow the plan you laid out earlier, don’t be afraid to add in new touches as you go – you want to give yourself the freedom to be creative at each stage. And you might also find that new conceptual connections reveal themselves only once you are actually putting it all down on one page. This might seem like a bit of a process – many steps that lead up to one finished product. 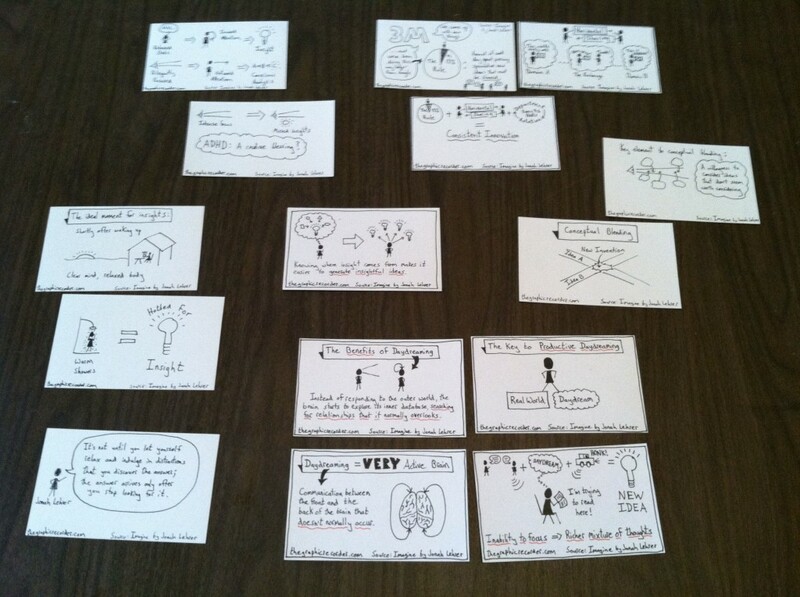 But this process is what helped me get over my anxiety of turning verbal ideas into visual ideas in just one step. The intermediate step of 3×5 cards gives you a sense of accomplishment early in the process AND it gives you something to work with even if you don’t reach the final stages of laying it out and creating a complete sketch. But I do encourage you to create the complete sketch – by putting it all together within one frame you are solidifying in your own brain the way in which each of the individual ideas are connected. This will give you a better understanding of the big picture and will also make it easier to recall both the details and the big picture in the future. Let me know what you think of this process. Does it work for you? What would you change about it to make it better fit your style?